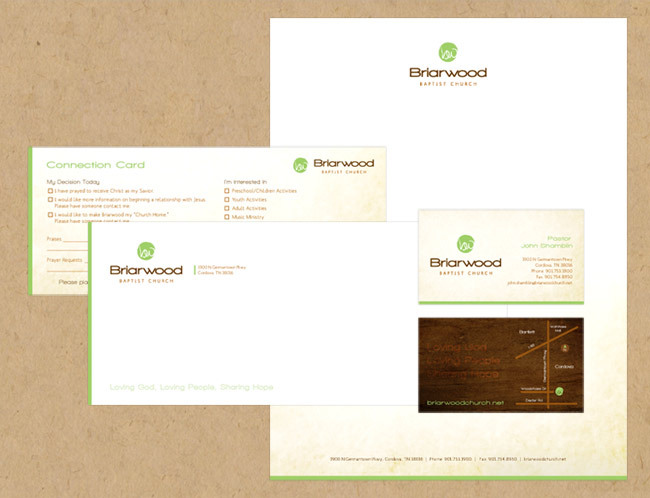 Briarwood, a vibrant church in Cordova, Tennessee, needed new branding materials to match their new logo that we designed. We created designs for their business cards, letterhead, envelope, and connection card (a card designed to help people connect with the church if they want to). We used some soft textures that enhance the style created with the logo, and continued the warm color palette. The bright green color is also present, used to add a cheerful note to the designs.